Science fiction model makers have a hotline to spacecraft of all kinds with Revell’s easykit range, and here’s one of the more recent ones to fly through the SMN Towers airlock. 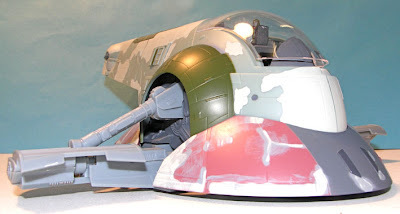 The Slave 1 is, as all Star Wars fans know well, the personal craft of interstellar bounty hunter Boba Fett, and it’s certainly one of the more unusually styled craft in the long-running sci-fi saga. As the unboxing video shows, I was pretty impressed with the kit contents. However it’s fair to say that the build I did after the video was made had its share of problems, in particular gaps around the nose-cone, poor-fitting chin cannon, and difficulty in assembling the side ‘wings’. To do a decent job you have to resort to your craft skills, forget the ‘easy’ bit, and treat Slave 1 to a dose of TLC. Even then, it’s best to fix those pesky wings in place rather than allow them to rotate freely. Having said that, the potential is there for a spectacular addition to the sci-fi model shelf, and even in Revell’s pre-painted colour scheme, Slave 1 looks pretty good when finished. I’m going to be giving the craft a thorough customization when I get a chance, and will post the results for all to see. At present, I’m thinking along the lines of a pre-Boba craft, heavily armed and armoured for anti-pirate operations, colour scheme a stealthy midnight black - maybe. A definite addition will be a set of landing legs - it just doesn’t look right with that big egg-shaped lower section sitting flat upon the deck! All in all, an interesting sci-fi kit. Be prepared for more than a simple slot-together 30-minute job, but don’t let that put you off - a little work will result in an excellent model. 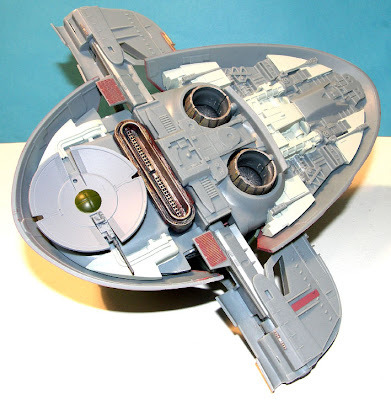 1, 2, 3 The assembled Slave 1 in Revell colours. The tail cannon rotate freely, and the overall appearance is good, though there are gaps in the nose-cone. 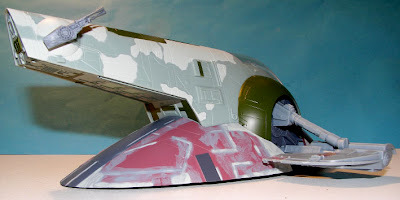 4 Underbelly view, showing the neatly-weathered engine exhausts. The chin dish has a pair of side-firing cannon, but these need cementing into place. One has already fallen out in this pic. The Revell Slave 1 is available from model stores and online suppliers, including Amazon at a small discount here.